Netflix vs Amazon Prime Instant Video – which is best? We pitch Netflix against Amazon Prime Instant Video to see which service is best for price, content and more. If you’re looking for the latest TV show to tuck into, or a film to get your pulse racing, choosing the right streaming service can be confusing. Both Netflix and Amazon Prime offer thousands of titles, but which one is right for you? We pitch the two against each other and let you know what to look out for. Amazon Prime is either £5.99 per month, for just its video on demand service, but most subscribers pay £79 per year for access to its video content, as well as other extras such as free shipping for products bought from its store. This upfront payment is very much the ace up Amazon’s sleeve, and an enticing offer if you’re a regular shopper. Amazon Prime also shows you titles that you can rent or buy that aren’t part of your subscription – don’t assume that everything you can see is included. Netflix’s pricing works on a sliding scale depending on the image quality you want, and the number of devices being used at the same time. For £5.99, you’ll receive the most basic service with standard definition image quality and streaming to one device. Since a full Amazon Prime subscription works out at £6.58 per month, Netflix will be the cheaper option for the majority of consumers. For high definition video, you’ll need to spend an extra £1, and opt for the £6.99 package, which lets you stream to two devices at once. Elsewhere, Netflix’s £8.99 per month Premium offering allows for streaming to up to four devices at once, and also Ultra HD, for those with 4K TVs. 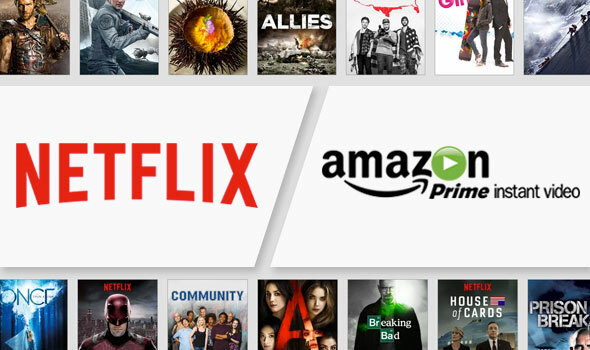 As you might expect, both Netflix and Amazon Prime offer free month trials so you can try out their services for yourself, but after this you’ll be charged a subscription fee. As there’s little difference in the price of the two services, the deciding factor for most people will be content. This is a fairly subjective matter, and both services cater for dedicated popcorn poppers and boxset bingers in their own way. In terms of exclusives, Netflix arguably has the biggest names, with series like Arrested Development, Breaking Bad spin-off Better Call Saul, and House of Cards all available. Amazon Prime offers its own exclusives, with TV shows like Vikings, Outlander and Ripper Street. Both also offer a wide range of films. While there’s plenty of crossover between the two services, there will be some films only available on one platform, due to exclusivity deals with studios. Whichever service you opt for, it’s important to remember that the content is subject to change. Unlike your dusty collection of video tapes and DVDs, films and TV shows on streaming services are regularly refreshed, meaning that while there’s always new stuff to watch, old favourites could disappear just as easily. A big difference between the two streaming services is how films and TV shows are displayed. Amazon Prime goes the traditional route, listing its content by genre, actor, director etc, and allowing you to drill down to find the sort of film or show you’d like to watch. Netflix’s personalised recommendations are more targeted and esoteric. While it’s possible to use the search function to find content with a certain actor or title, the front end of the service is set up for browsing by very loose terms. These could be ‘Witty Sitcoms’ or ‘Films to make you jump’. To find something to watch you’ll need to scroll through the appropriate category. It can be a good way of stumbling across something interesting, but if you have something specific in mind, the search function is much quicker. Are you nutty about Netflix or passionate about Prime? Let us know what you think of either service in the comments below.